Less than a year ago, the Keizer Police Department and Oregon Department of Human Services (DHS) embarked on a pilot project to place two child protective services (CPS) case managers at the Keizer police station. The program’s successes are already changing the way DHS assigns case workers and smoothing relationships between public safety officers and case managers. Hillary Roeder, the other CPS case manager working alongside Keizer police offered an example. 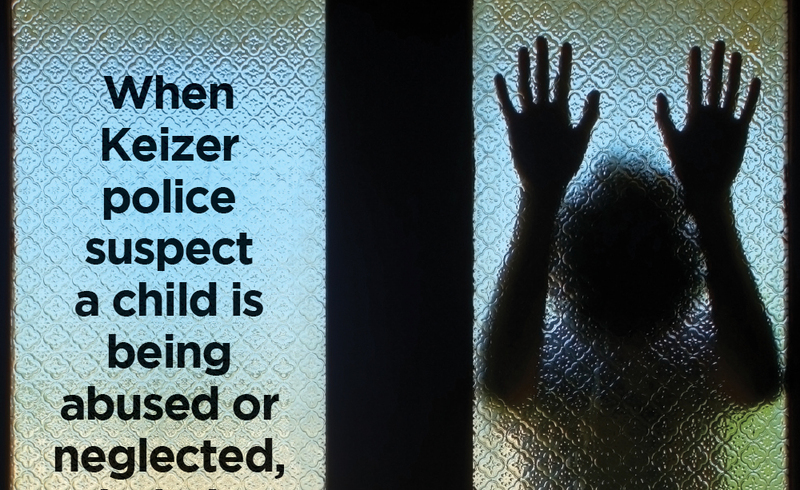 “If we get a report of potential abuse, we need to respond in 24 hours, which means talking to the child and then letting the parents know we talked with their child,” Roeder said. Typically, that means meeting a child at school where the concern was raised and then meeting with the parents at their home, but those needs can clash with priorities on the law enforcement side of the equation. “If it becomes more of a criminal investigation, law enforcement likes to wait to talk with the perpetrator until after they have done other interviews. Knowing that, we can often coordinate and go do those interviews together,” Roeder said. The collaboration is streamlining the process for everyone involved, said Dawn Hunter, child welfare program manager for DHS. “If we can get all the information we need off one interview, it’s better for kids and better for families,” Hunter said. The idea for the program sprouted from conversations between Hunter and Det. Chris Nelson, who are both part of a multidisciplinary team at Salem’s Liberty House. Liberty House provides free medical screening is cases of suspected abuse and neglect. Nelson told Hunter that when he was working drug investigations in years past, the team had a dedicated case manager they worked with and the relationship was highly beneficial. They took the idea back to their respective agencies and Manriquez and Roeder soon had new desks at the Keizer police station. “When it started we didn’t know what to expect. We weren’t sure if our case managers would be just checking in at the front desk and then working somewhere else, but KPD has been very gracious,” Hunter said. CPS case managers are often the first contact for children and families when suspected abuse is reported. Manriquez and Roeder might work with a family for an average of six weeks before closing out a case or making the decision as to whether alternative housing or long-term assistance is needed for children. The closer communication between case managers and detectives, as well as patrol officers, has helped in some expected ways and even more unplanned ones. Within the department, case managers and officers are learning how each agency conducts interviews and what they are looking for when contacting a person. “We have greater confidence in each other’s interviews because we’ve done enough of them together,” Roeder said. There is also greater information-sharing, which can make a huge difference in helping a child or family in crisis. Having deeper roots in the department means Manriquez and Roeder can put a face to an officer name on a police report and seek out additional information when needed. When reports come into one agency and the other is familiar with the family from past encounters, that information is shared as well. While the stereotype of DHS work is taking children from their families, Roeder and Manriuquez said the number of times when that’s necessary is surprisingly low. It’s also common for officers to call on Roeder and Manriquez when talking with families at the police station. Without the case managers’ presence, an officer would have to call a hotline number and then wait for the next case manager to come available. Both case managers had worked those kinds of shifts before coming to KPD. One of the more unexpected benefits is the reception by the larger community. Roeder and Hunter both heard from school administrators who are relieved when a familiar face shows up at the school once a report is made. “That wasn’t a benefit that was even on my radar when we started this program,” Hunter said. Because the program paid such rapid dividends, Hunter said Marion County’s 36 CPS case managers are now being assigned geographically rather than traversing the county on a sometimes hourly basis. As the program continues, Roeder and Manriquez said mentioned a benefit that is more intangible. Keizer Police Department is understaffed for a city of 38,000 people, Manriquez and Roeder take on three to five new cases each week. Both roles often require long hours with occasionally traumatic work that creates mental burdens not easily shared with loved ones. “At the end of the day, when we’ve had a rough case, we can sit down with the officers and debrief and move past it together,” Manriquez said. “Over time we’ve built good relationships. There’s laughter and humor in addition to the rough stuff, and that has been so helpful when there are hard cases,” added Roeder.